A new study published today in The Journal of Applied Physiology concludes that prosthetic legs worn by double amputee sprinter Oscar Pistorius give him an unfair advantage over able-bodied runners. In the study, “The fastest runner on artificial legs: different limbs, similar function?,” researchers said Pistorius’s blades allow him to turn over his strides more quickly and with more power than a runner with biological legs. “We conclude that running on modern, lower-limb sprinting prostheses appears to be physiologically similar but mechanically different from running with intact limbs,” the report says. Researchers conducted three tests that compared his prosthetic limbs and those of competitive male runners with intact limbs. They determined that Pistorius expended less energy when he ran, particularly when comparing him against runners in the 400-meter speciality. Also, the study says Pistorius benefits from enhanced running mechanics on his blades, including longer foot-ground contact time and less time in the air. 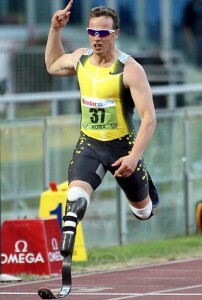 The debate over Pistorious’s recent competitive successes has triggered an international controversy regarding the possible advantage provided by his artificial limbs. Pistorius fought the International Association of Athletics Federations, track and field’s world governing body, which initially barred him from the Olympics. However, the I.A.A.F. decision was appealed, and Pistorious was allowed to compete in the 2008 Beijing Olympics, but he failed to qualify by less than a second. Now, as Pistorius is in training, no doubt, for the 2012 Olympics in London, he may still be allowed to compete, but the study raises new questions about the legality of his blades, at least among spectators and other athletes.